Can I hardly even wait to tell you about these SNACKSICLES? No. I cannot. So, popsicle week is an actual thing. It was started by Billy of Wit and Vinegar (do you know Billy? You should know Billy. He is hilarious and creates things of beauty like this and only the best GIFS to ever grace the internets) and I believe that this is the third year running. It’s my first year participating though, because I’m no fun. At least I’m fun this year! No fun the last two years. Bah. What’s in a late night snacksicle? ALL the sweet and salty things. Lots of them. Buttery crackers, salty pretzels, chocolate m&m’s and big, fat peanut butter cups. Swirled and smushed into a vanilla bean graham ice cream base. Whyyyyy did I have to buy so many for the pops because now it’s midnight and I just want to go on a massive PB cup binge. STAY AWAY FROM THE CUPS. I was semi-inspired by that late night snack Ben and Jerry’s flavor as well as this munchies ice cream flavor. And who doesn’t want to eat all the snacks, all the time? Can so very rarely have sweet without salty. It’s a sickness. I swear. You get me, right? You can make these snacksicles two different ways. First, you can make the vanilla graham base and smash all the ingredients inside, then fill the molds. The popsicle result will come out like the photo right there above – all swirly and together and stuff. OR. 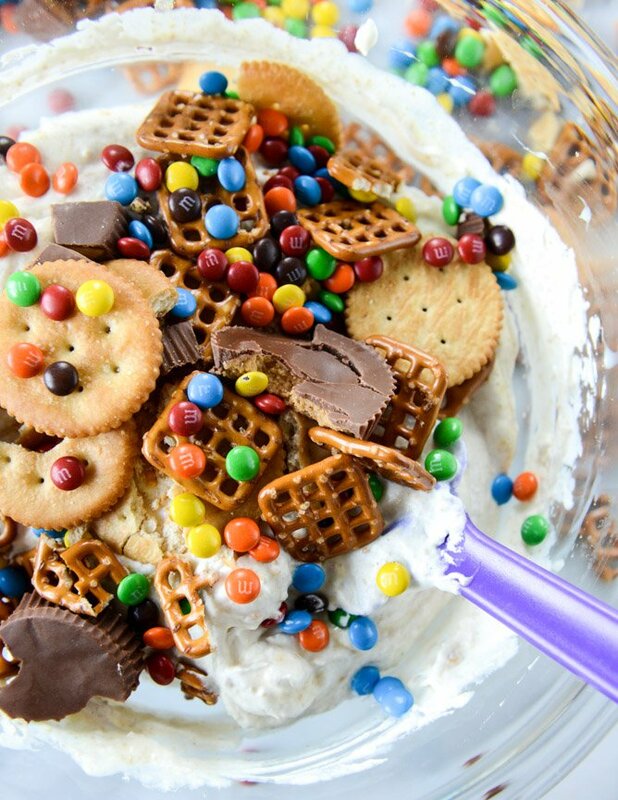 You can fill the molds with layers of the ice cream based and crushed snacks. You can see that way below! It results in a popsicle that has chunks of snacks for a big surprise bite. We made a leeeeettle video. So we kinda sorta took a stab at video-ing the process of me making these snacksicles for the fortieth time. For selfish purposes, of course. We really want to start making more videos of Max + summer time fun + life that aren’t just on our phones so we can have them down the line (think old school, giant video camera life) for memories. And I may share one here or there over on crumbs if we actually do this thang, but we shall see. For today, it’s all about popsicles. And snacks! Snacky popsicles. I declare this summer this summer of snacksicles. If you make these snacksickles (and/or popsicles) this week, make sure to tag your ‘sicles with #popsicleweek! And with #howsweeteats, duh. In a large bowl, whisk together the milks and vanilla bean paste. Stir in the graham crumbs with a spatula. Fill the popsicle molds about 1/4 of the way full, then crumbed in a few pieces of crackers, pretzels, peanut butter cups and m&m’s. I repeat this a few times until the mixture reaches the top – just make sure there is liquid in the entire mold to “hold” the snacks in! Freeze the pops for one hour, then after an entire, stick a popsicle stick down into the milk. Freezer for 4 to 6 hours, or overnight. To release the pops, set the mold in a bowl/pan/dish/tub of warm water for 30 to 60 seconds. Gently pull out the popsicles! Love this! Can you tell us which popsicle mold you liked best? The one in the pictures, or the one in the video? The price difference on Amazon is pretty hefty. Is it worth it? Thanks! i’ve tried about 5 different ones over the years and this is the best and easiest in my opinion. i don’t so much love the one i used in the video (as you can see it toppled over! ), but had other popsicles in the first one so i had no choice! So I’ve been following your blog for awhile, and I feel like we are cooking soulmates. These are absolutely ridiculous– like holding back excited cursing ridiculous! Making these this weekend. Keep up the good work! Love love love your site and recipes! Can hardly wait to try these but I also want to know what cute little soundtrack you used in your video! I’m kind of mad at you because of how good these look. Ok, I’m over it now, and that video is awesome! What’s the nailpolish color you’re wearing in the video?! So pretty! Wow, these look incredibly good! ¡Fantástica receta! Estos helados harán las delicias de los más pequeños de la casa y porque no de los mayores. Gracias por compartir esta rica receta. Jessica these are my dream pops!! I need to make these like now! These sound seriously crave-worthy and like the perfect late-night snack! JESS I love this and I love that video with all my heart!!!!! Yes to all of this! Love the video! 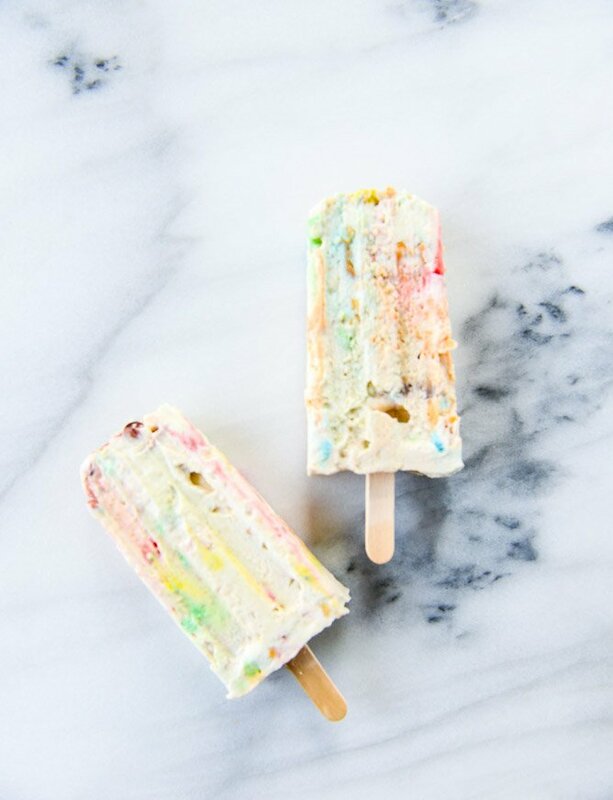 I wish these snacksicles would magically appear in my freezer. Btw, how many times did you misspell snacksicles while writing this post? My fingers just don’t wanna type it which is an injustice to the magic of the word snacksicles. Jessica! I found you through popsicle week, but I am loving your blog already. I grew up outside of Pittsburgh and went to Duquesne. So nice to see a little bit of home on the food blog circuit :) I’ll def be coming back soon !! hi brett! thanks so much! i also went to duquesne! Loved the video, so cute Jess! Can’t wait to see more!! YUM love the video!! I am a dietitian and I often turn to your blog for both deliciously healthy recipes and super indulgent ones when I feel the need to derail. THANKS! These are insanely delicious! I have to try something similar to this!! Oh my! These look amazing. Glad you are fun this year!! Oh noooooo I clicked on crumbs and just now realised that I missed out on so many posts :( Normally the tuesday-things-posts (my faves!!) appeared in my Bloglovin-feed, but they haven’t for the last couple of months and I thought that you just stopped writing them and that made me sad. But they were just hidden away! This recipe looks awesome! Can you use something other than coconut milk? My fiance really doesn’t like coconut flavor. Any advice would be appreciated!